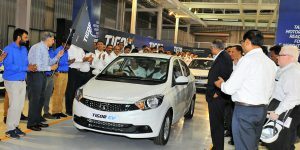 Tata Motors completed the first electric-powered Tigor models that are actually the avant-garde of a total of 10,000 cars recently ordered by the government-run Energy Efficiency Services Ltd (EESL). The Tigor EV rolls off the lines in Sanand, Gujarat, and is so far reserved for the EESL, a branch of the Ministry of Power, only. If it will get available on the free market is not yet decided. As reported, the Indian government in Delhi decided to turn to local Tata Motors to supply 10,000 electric cars following its successful bid in a tender that saw Mahindra and Nissan partake as well. Later, the tender was matched by Mahindra & Mahindra. The new EVs will be used to replace government cars over the next four to five years but can only mark a starting point given that India’s official fleet incorporates about half a million vehicles. Tata Motors will supply the EVs in two phases.